"Recycling is not the answer, producing less rubbish in the first place is." 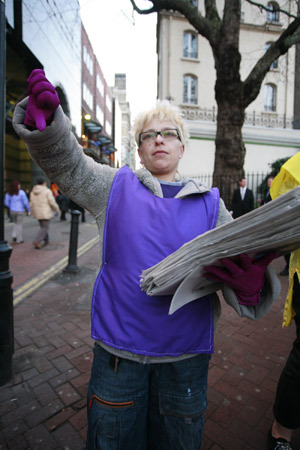 Ten tonnes of waste per week is generated by the free newspapers in Westminster alone, which is not a problem that can be solved just by recycling. 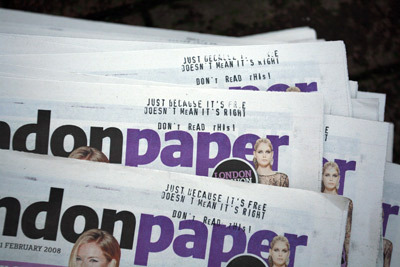 The only solution to the problem is to remove it - stop printing the papers. 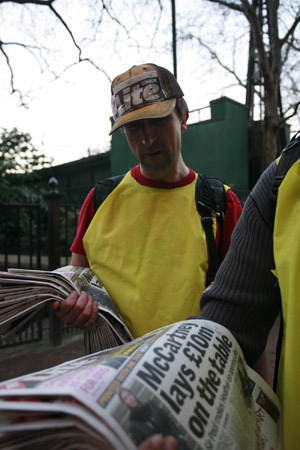 In an attempt to get this message out, a group of intrepid paper boys and girls decided to use the tactics of The London Paper and London Lite, putting their own pro-recycling anti-waste propaganda into copies of the papers then aggressively and relentlessly forcing them on the public. 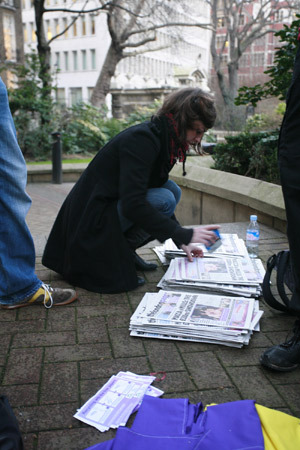 At approximately 5pm sharp, paper distribution began. 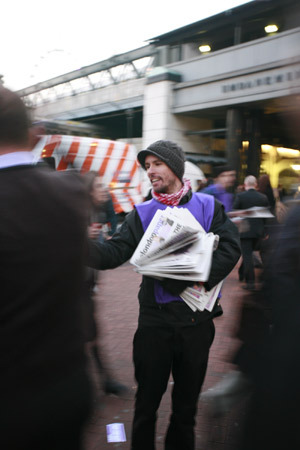 The London Paper and London Lite teams competed for the attention of commuters, pointing out the numerous differences between the papers and the quality of their contents. The teams, while obviously agreeing that they were both giving away highly sophisticated and intellectually stimulating publications, didn't agree on which one was in fact superior. Sarcasm aside, this is another issue with the free newspapers - that they are filled with second rate celebrity gossip, inane half-stories, and above all, advertising. Really, do these newspapers contain any actual news? Is what they have to say so important that it's worth 10 tonnes of waste paper a week? As the competition grew more intense, war paint was smeared and the battle began. Papers were given and replaced and given again, with distributors from each team competing over individual members of the public, leading to violent confrontations with each other. 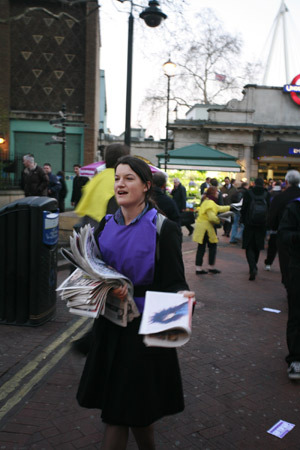 The official employees of both free papers seemed baffled but amused, taking photographs of the event. However, an employee of The Evening Standard, driving up in his van, seemed to be less than impressed, attempting to take away some of the papers and generally behaving in a rather ungentlemanly fashion. Then, as two opposing team members were locked in combat, a policeman on a horse appeared and politely and calmly requested that all the students just stop that and come and speak to him right now. As only a couple of the group were students, the action mostly continued until he got a bit upset. When all the paper boys and girls were gathered around the horse, they were told "You just can't do that!" "Stop it!" "I'll arrest you!" "Just stop it!" and "Calm down!". 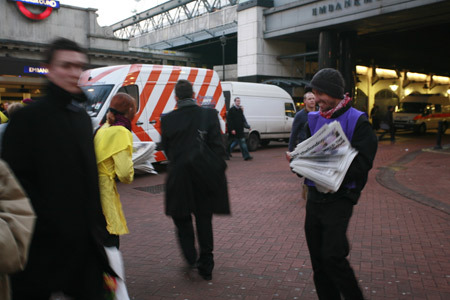 After agreeing that it was indeed rude to force newspapers on unsuspecting pedestrians, but that they would calm down, the paper distributing continued a little less violently. 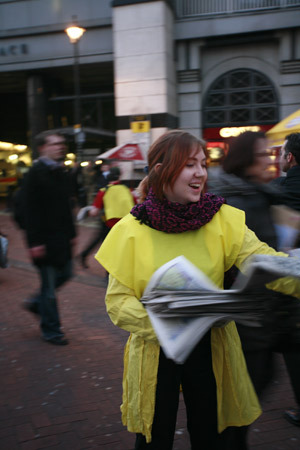 Passers-by were offered 'The London Litter', 'free rubbish', and 'news' (though unfortunately there was no news available), and were assured that they could throw it away whenever and wherever they liked. In fact, the more they threw away the better. Some people seemed quite keen to get their free rubbish, some were irritated and a few were genuinely interested in what was being said. Sadly, some more policemen (who didn't have horses) turned up and told the paper girls and boys that really it was time to stop it now. Moderately aggressive at first, they were won over by the charm of the paperers, reportedly even taking some (100% recycled!) leaflets for their colleagues. By this point all the newspapers had gone and it was at least half past beer o'clock, so after a little chat with the police (and picking up any litter that may have been left), it was declared a victory and they headed off.